It's a classic - almost! 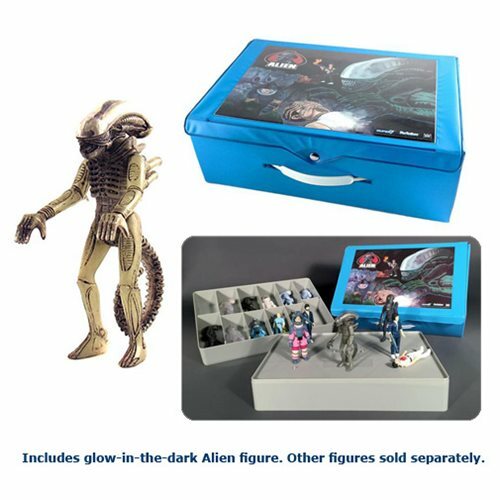 The Alien ReAction Figure Carry Case with Figure delivers a retro Kenner-style vinyl action figure carry case, just like you might have seen in 1979. It holds up to 24 3 3/4-inch action figures, and has a gorgeous painting on the cover that looks like it stepped right out of a vintage mail-order toy catalog. What's more, you get a bonus "Big Chap" glow in the dark Alien 3 3/4-inch scale retro action figure right in the case! What's more, each tray can be flipped over to use as a sturdy action stage diorama for your action figures. Don't miss it!